Author’s preface: having spent more than 30 years in public service, it frustrates me to see any level of government making anything less than a consistent, substantial and meaningful effort to engage the broader public in its decision making. All public entities should be held to this high standard, whether local, state or federal. So, when I stumbled across the Bonneville Power Association (BPA) decision to significantly rebuild the prominent power line corridor that links Bonneville Dam to Hood River, I was disappointed to learn that the decision involved a handful of select stakeholders and two short windows for public comment that saw little notice or participation. We should expect more, and the BPA should step up its commitment to real public engagement, not meager efforts that do little more than check regulatory boxes. According to a retired BPA employee who once joined me on a hike near Starvation Creek, the daring alignment of the power line corridor that provided the first electricity from Bonneville Dam to Hood River is the doing of no less than Franklin D. Roosevelt. As the story goes, FDR was on his famous tour of the Mount Hood Loop Highway on September 28, 1937, with stops to inspect Bonneville Dam and dedicate Timberline Lodge. 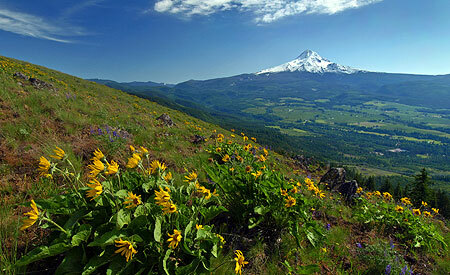 So began the project to build the BPA power lines across the rugged cliff faces of the Columbia River Gorge. Amazingly, most of the work was done by hand, with pack mules carrying materials to the often dizzying cliff-top tower locations. While it’s hard to view any power line as “scenic”, the sheer audacity in how these towers were designed and built can’t help but impress hikers passing under them today. The Bonneville to Hood River corridor is one among many power lines that transmit hydro-power along the Columbia, but this corridor is notable in that much of it is serviced through a network of trails where the terrain was too extreme to support service roads. Many of these trails have morphed into recreation trails over the years. 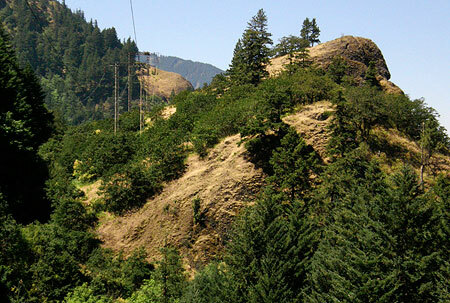 After eighty years of maintaining the Gorge power line corridor in much the same state, the BPA is about to significantly change both the look of the towers and some of the access routes. I stumbled across this reality earlier this spring when I was exploring the area above Viento State Park, where I encountered a few dozen mature Douglas fir marked for cutting. At first, I thought it might be a thinning project of some sort, but upon some research, discovered that the BPA was about to replace all of the steel towers and many of the wood pole towers along the corridor and expand several of the access spur roads. Up to 30 of the new towers will be steel “mono-poles”, a departure in both look and height from somewhat rustic old structures that now exist on the corridor. The project also proposes to remove up to 747 trees to allow access roads to be widened and rebuilt, and the BPA proposes “temporary disturbance” to over 58 acres and “permanent disturbance” to about one-third of an acre. 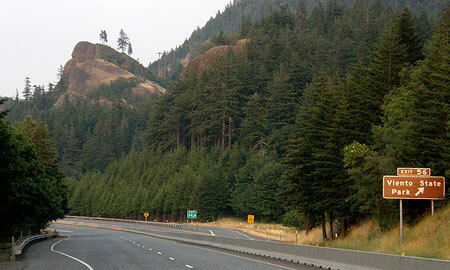 For the scoping phase of this project, the BPA opened a public comment period of six weeks and held a public meeting in Hood River in the spring of 2014. They received 12 written comments during the scoping phase and four people attended this meeting. Sadly, this dismal turnout was during the critical window for raising issues to be considered by the BPA as part of the environmental assessment. The agency also reached out to tribes and a few interest groups they have long engaged in their public outreach, but their effort falls short of a meaningful commitment to fully engage the public, as evidenced by the meager input they received. The BPA held a second public meeting and opened a final six-week comment period on the draft environmental assessment last fall. As one of the largest and most reliably funded public agencies in existence, the BPA can and should do better. 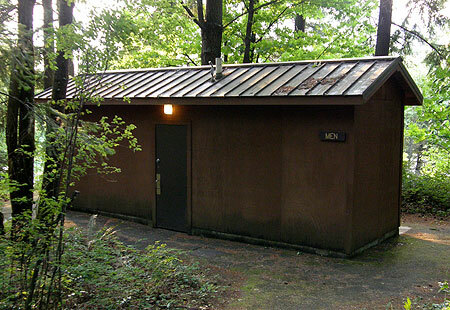 [The BPA should] mitigate scenic impacts by installing new structures that would be less visually discordant in the landscape. Where steel towers are needed, we ask that weathering steel be employed to reduce visibility. 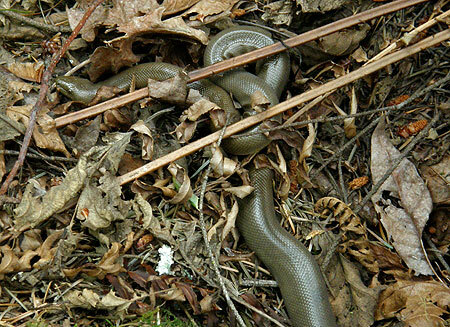 Include a robust invasive species eradication and restoration strategy. The BPA transmission line corridor is frequently infested with invasive plants, such as Armenian blackberry. While replacing structures, BPA should remove invasive plants and restore native vegetation communities that would be compatible with long-term vegetation management requirements. BPA should also thoroughly document existing native vegetation communities and determine the need for future vegetation management. BPA’s past vegetation removal efforts have removed vegetation that poses no threat to the transmission line system, which unnecessarily harms wildlife habitat and creates openings for invasive plants. Contrary to this, the improved roads will stand out visually as artificial, in what’s already an artificial corridor of cleared vegetation. The improvements would disrupt the PCT traveler’s experience because they clearly mark human manipulation and diminish the desired sense of remoteness from civilization. While it’s suboptimal for the PCT to follow any road at all, at least the existing condition of the road is rustic. Upgrades to the road, including resurfacing with imported materials, will make it appear and feel more industrialized for the PCT traveler. A related effect, because the road is already dominant over the trail, is that people get lost and continue to follow the road, despite trail signage. Improving the road would exacerbate this situation. The trail crosses directly under one of the structures, in fact, between the poles and their guy lines. This site can’t help but appear impacted by the proposed improvements. There will be three poles instead of two, and, clearly a good deal of ground disturbance involved in upgrading this structure. These exacerbated visual impacts to the trail could be best ameliorated by reconfiguring the intersection, and reconstructing portions of the PCT where necessary to meet the BPA line in a spot that lends itself better to disguise. Such a trail relocation would be as much as .5 mile long, and would require its own NEPA study. We propose that this NEPA study, and subsequent trail construction by PCTA’s volunteer crews, be funded by BPA as a mitigation measure. 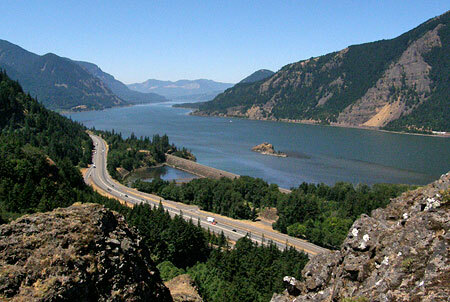 The Columbia River Gorge National Scenic Area (CRGNSA) unit of the U.S. Forest Service wrote extensive comments, mostly reminding the BPA of regulatory requirements related to the Gorge and the need to conduct environmental assessments when trails or other recreation facilities within the corridor would be significantly impact. The CRGNSA did not comment on opportunities to improve the access trails along the corridor to serve as recreational trails. Removal of wood-pole and lattice-steel H-frame transmission line structures constructed prior to 1999 (including cross arms, insulators, hardware, and guy wires) and replacement with a combination of wood-pole H-frame structures and steel-monopole structures. Retirement of unnecessary transmission line structures. Replacements of conductors and guy wires. Replacement of insulators and hardware in locations with no structure or conductor replacement. Improvement, reconstruction, and extension of existing access roads and trails. Installation or replacement of bridges, fords, culverts, and access road gates. Establishment of temporary staging areas, helicopter flight yards, and tensioning sites (for pulling and tensioning conductors). Installation of temporary guard structures for stringing lines over roads and other utilities. Removal of vegetation at various locations along the transmission line right-of-way and access roads. Re-vegetation of areas disturbed by construction activities. Hikers are mostly likely to notice the changes on trails that also serve as access to the power lines or cross the corridor, including the Pacific Crest Trail, Starvation Ridge, Mount Defiance, Wygant and Mitchell Point trails. Off-trail explorers will also see changes in the bluffs above Viento State Park and on Shellrock Mountain. “BPA currently uses a combination of existing roads and foot trails to access the transmission line. BPA holds permits and access road and foot trail easements for access across public and private land. Through these permits and easements, BPA has previously constructed roads and foot trails to access the transmission line. These access roads and foot trails are primarily located within the transmission line right-of-way, but there are also some access roads and foot trails located outside the right-of-way where required due to terrain constraints or other factors. In a few locations, BPA currently does not have express easement rights to use some existing roads or foot trails that provide access to the transmission line. At these locations, BPA would acquire about 4.4 miles of easement rights to use various sections of the existing roads and trails. Generally, BPA obtains a 50-foot-wide easement for access road rights and 20-foot-wide easements for foot trails. BPA’s existing access roads for the line are typically 14 feet wide with an additional 3-foot offset from each side for slopes or drainage ditches, resulting in a total disturbance width of about 20 feet. Access road reconstruction and improvement activities associated with the Proposed Action would occur within this prism, except in areas with curves or on steep slopes where work would occur outside of this prism because of necessary cut and fill. In areas with identified sensitive resources, such as wetlands or sensitive habitat, access road widths would be reduced to 12 feet and the offsets on either side would be reduced to 2 feet, for a total area of disturbance of 16 feet to minimize temporary and permanent impacts. 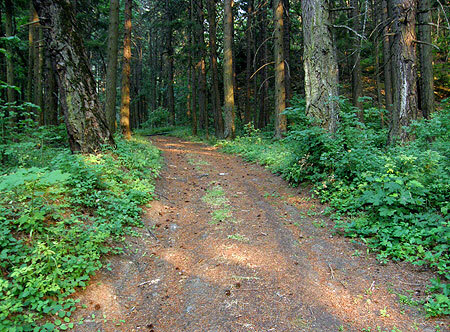 Trail reconstruction or extension activities would result in a typical trail bed width of 18 inches that would require a total clearing area of 2 to 4 feet. For trails crossing steep talus areas, such as Shellrock Mountain, trail bed widths may be as small as 12 inches due terrain constraints. To provide trail stability in these steep areas, sideboards would be installed with rebar or rocks would be keyed into the hill. More information on the project can be found on the BPA’s project website. With a little more effort in their public outreach (like contacting trail organizations), the BPA would certainly have heard plenty of comments from the general public, and especially from hikers who regularly visit the corridor. Much of the commentary would likely have focused on how popular trails like Starvation Ridge and Mount Defiance will be impacted by the project. But it could also have been an opportunity for hikers to propose expanded use of the power line trails by hikers, including areas like Shellrock Mountain and the area between Starvation Creek and Viento Creek that have tremendous scenic value. While the Forest Service declined to call out this opportunity, these trail sections also could help complete Gorge Trail 400. No doubt the BPA wouldn’t be enthusiastic about bringing more hikers to the corridor, but the land belongs to the public and there’s no reason not to make full use of the routes the BPA will be building and maintaining with our public funds. The most interesting section of BPA trail that is not currently a signed route is the trail over Shellrock Mountain. While this is only for the most experienced hikers today, it’s a great adventure that includes magnificent views of the Gorge that few enjoy. Hopefully, this route will someday be connected to Gorge Trail 400 — as it should have been as part of this project. In the meantime, consider exploring the corridor by visiting the connecting trails at Mitchell Point, Wygant Peak, Starvation Creek and where the PCT crosses the corridor on the route to Dry Creek Falls. 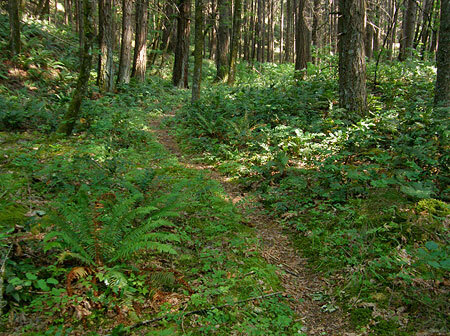 Most of the land in the corridor is in public ownership and managed by Oregon Parks and Recreation or the U.S. Forest Service, so you are free to walk the trails and service roads here. This is the best way to see first-hand how your public lands are being managed, even if the BPA has let us down in their efforts to involve the public in this project. 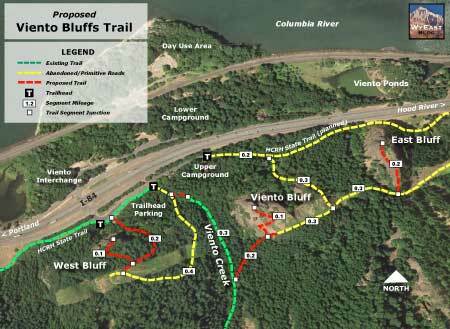 This is the third in a series of new trail proposals for Oregon State Parks land in the Columbia Gorge. 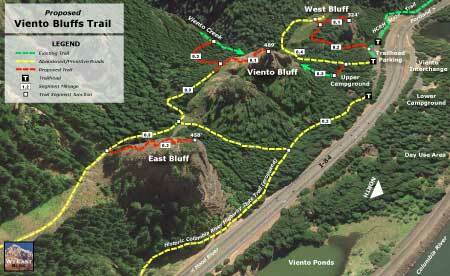 This article follows previous proposals for a Bridal Veil Canyon Trail and Angels Rest Loop. All three have the potential to fit into the Oregon State Parks and Recreation (OSPRD) master planning for the Columbia Gorge that is happening right now. Like the Angels Rest Loop and Bridal Veil Canyon proposals, this trail would be aimed at families, vacationing visitors to the region and those trying out hiking for the first time. Unlike the earlier proposals, the Viento area is little known to most who visit the Gorge. 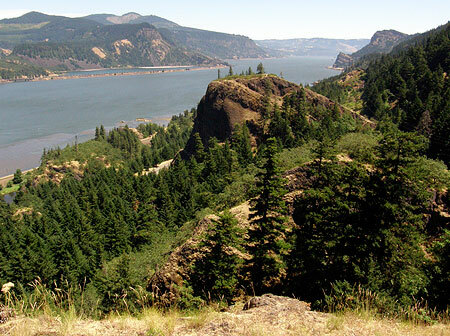 For a moderate effort, this proposal would provide explore the unique, transitional ecosystem found in the mid-section of the Gorge, as well as some sweeping views and towering cliffs. The Viento proposal stitches together several rustic service roads that already exist with new trail segments that would take hikers to three separate, cliff-top viewpoints. All three viewpoints rise high above the popular campgrounds at Viento State Park, and would provide an excellent, moderate hiking challenge for campers and day-visitors, alike. The map above shows the proposed network of trails, and the oblique view, below, gives a sense of the steep topography that would make the Viento area so interesting as a hiking destination. 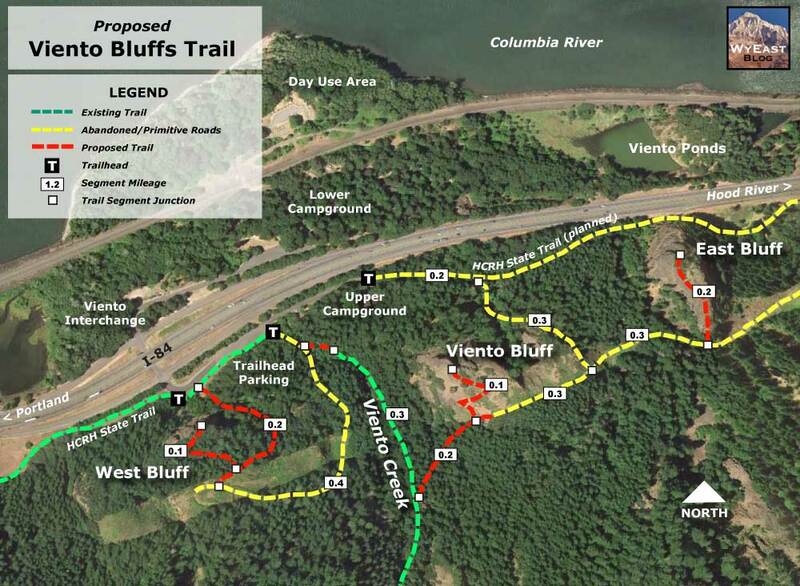 The proposed Viento Bluff trails would also build on a planned extension of the mostly-complete Historic Columbia River Highway (HCRH) State Trail, providing bike-and-hike opportunities along this emerging, world-class facility. A six-million dollar extension of the trail will soon extend east from the Viento Trailhead to Perham Creek, completing another link in a route that will eventually extend from Troutdale to The Dalles. A bit of history on the name “Viento” is in order. While the word means “windy” in Spanish — an often fitting name for this narrow spot in the Gorge — the name was actually coined in the 1800s for an early railroad stop in the area using the first two letters from the surnames of railroad builder Henry Villard, one of his investors, William Endicott, and a local railroad contractor named Tolman (the origin of the name and other local history can be found on an interpretive display near the entrance to Viento State Park). The following is a detailed description of the three viewpoints that make up the Viento Bluffs and proposed trails that would lead to them. The main focus of the proposed trail network is Viento Bluff, the most prominent of the rocky outcrops that rise above Viento State Park, and a familiar landmark to travelers passing through the Gorge. While Viento Bluff rises as sheer, 300-foot vertical wall on its north face, the steeply tilted basalt flows that form the bluff have a relatively gentle, meadow-covered south slope. The proposed summit trail would circle the bluff to reach this southern approach. 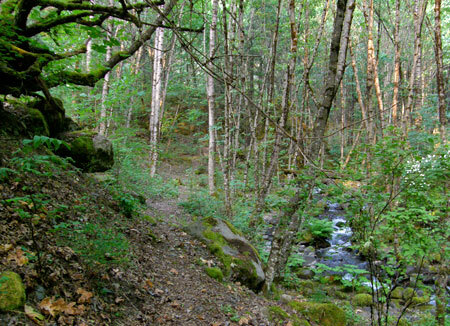 The trail would begin at the existing day use parking area at the Upper Viento Campground, initially traveling on an existing footpath that follows Viento Creek into its shady, forested canyon. Here, the project would consist of a new footbridge connecting the existing trailhead to the old footpath, and improving the existing tread to basic trail standards. The existing footpath appears to be one of the many vestiges of the Civilian Conservation Corps (CCC) in the Viento area. The CCC was created by Franklin D. Roosevelt as part of his Great Depression-era “New Deal” to put young men to work making infrastructure improvements to public lands across the country. 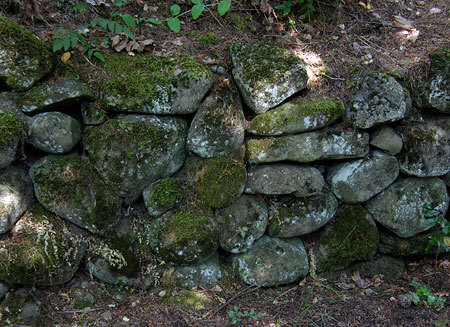 Several stone retaining walls in the area, the original (upper) Viento campground and a collapsed campground water house still remain from the CCC period. 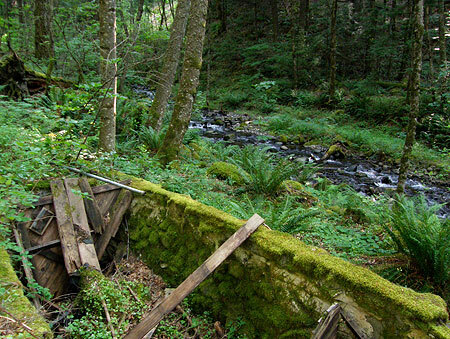 The surviving footpath originally led to the water house, but now terminates at its moss-covered ruins, along a pretty section of Viento Creek. From near the end of the existing footpath, the proposed route would turn east, climbing the slope to Viento Bluff in an easy traverse along a heavily used game trail. 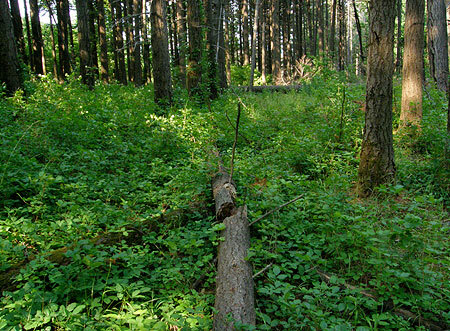 The deer and elk have done a find job in this section, with a grade that works well as a hiking trail! Soon, this game trail reaches a forested saddle behind Viento Bluff, and enters one of the most lush, abundant stands of poison oak anywhere in the Gorge — one of the few obstacles to realizing the Viento Bluffs trail. While it’s an ominous sight for anyone sensitive to poison oak, routing a trail to the bluff through this section would be less difficult than appearances might suggest. The open, meadow-covered south slope of the bluff is only about 20 yards beyond the poison oak section, so the exposure would be no more than many trails in the Gorge that pass through poison oak patches. But it would need to be built carefully, and maintained accordingly. Poison Oak heaven in the saddle south of Viento Bluff! From the saddle, the route reaches the stuff of a dirt service road approaching from the east (more about that in a moment), and from this point, the proposed summit trail would begin an exceptionally scenic ascent of Viento Bluff’s south slope, traversing a steep meadow in switchbacks through scattered White Oak and Ponderosa Pine. The summit of Viento Bluff is exposed on three sides, with vertical drops into the forest below. If this were a remote wilderness viewpoint, simply terminating the viewpoint trail at the top would be safe enough. But because it’s a state park with families and less-experienced hikers, some sort of cable or wood railing would probably be needed here. The wood railings at the Bridal Veil State Park overlook might be a good model for this site, and easily constructed here. The view from the summit of Viento Bluff is impressive, especially given the relatively moderate climb required. 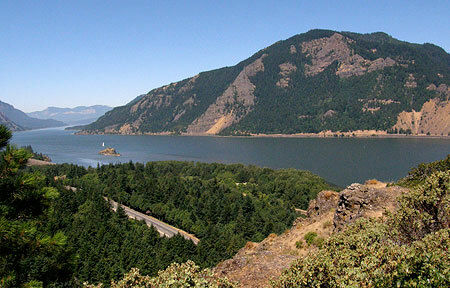 The rocky slopes of Dog Mountain dominate the view across the Columbia River, and the sweeping panorama extends as far west as Table Mountain and east to Mitchell Point and the town of White Salmon, beyond. The summit is quite spacious, providing room for visitors to sit and spend some time taking in the scene or having a trailside picnic. It is also far enough above the busy river corridor to be largely beyond the noise of traffic, while still allowing for interesting views of trucks, trains and barges passing by in the busy transportation corridor provided by the Columbia River Gorge. The second trail in this proposal would lead from the Upper Viento Campground and trailhead to the East Bluff, an impressive basalt outcrop that is nearly as imposing as Viento Bluff. 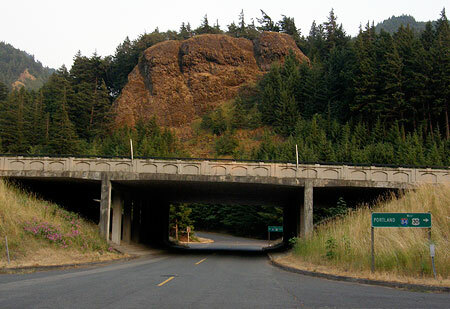 The East Bluff rises directly above I-84, yet is oddly less visible from the freeway, and therefore less familiar to travelers. The route to the East Bluff would begin along the proposed extension of the HCRH State Trail, east of the Upper Viento Campground. From a point along the State Trail route, about one quarter mile beyond the campground, a primitive service heads south, climbing the steep ravine between the East Bluff and Viento Bluff. This spur road soon reaches in the power line corridor that crosses the saddle to south of the two bluffs. From the saddle, one fork of the service road heads to the right, to Viento Bluff, as mentioned previously in this article. Along with the proposed new trail from Viento Creek, this route would create a loop hike to Viento Bluff, and a connection to the East Bluff (see map). The left fork of the service road heads toward the East Bluff. This proposal calls for a new trail here, leaving the service road and traversing the open south slopes of the East Bluff in switchbacks. The views from the East Bluff are expansive, encompassing the same stretch of the Gorge as the view from Viento Bluff, but including a unique perspective of Viento Bluff, itself. 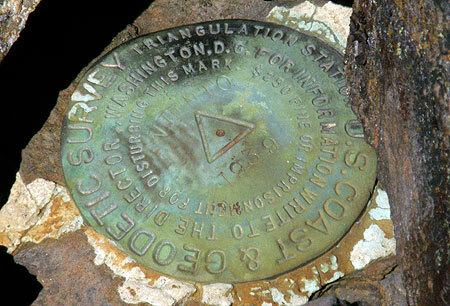 The true summit of the East Bluff has a brass 1939 U.S. Geological Survey marker stamped “Viento”. The survey marker dates to the year when Bonneville Dam had just been completed, along with the old power line corridor behind the bluffs that took power from the new dam to Hood River and points east — likely the reason for a survey marker in this spot. The summit of the East Bluff is quite broad, and even somewhat brushy in spots. But several dramatic viewpoints ring the edges — much like Angels Rest in the western Gorge, but with a lot less effort. Like Viento Bluff, the cliffs are extremely exposed, and would require some sort of cable or wood fencing, given the location in a state park and relatively easy access. The loop connection to the proposed Viento Bluff trail (from Viento Creek) would allow for both summits to be included on a longer hike, or simply a hike around Viento Bluff for those who don’t want to climb the actual summit. 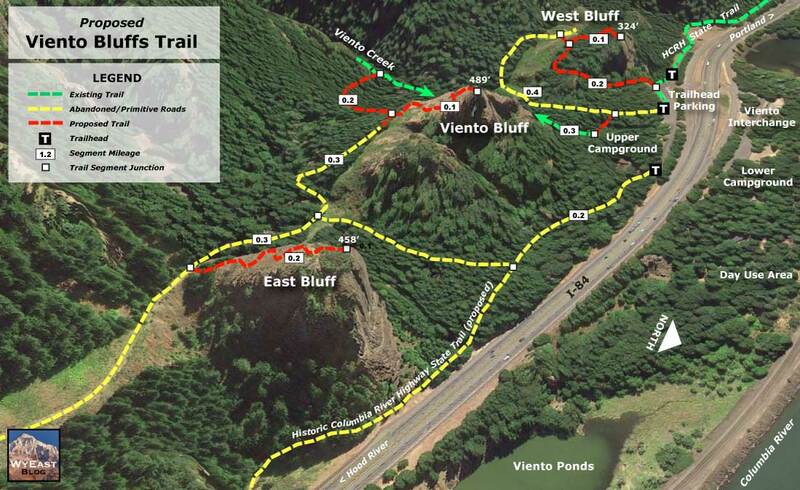 The third piece of the Viento proposal is a short loop trail to the west bluff, a basalt wall rising 250 feet above the Viento interchange and Upper Viento Campground trailhead. The purpose of the West Bluff trail is to provide a more approachable destination for less ambitious or able-bodied hikers and families with small children. While not as imposing as Viento Bluff and the East Bluff, the West Bluff still delivers impressive views of the Columbia Gorge and an interesting, almost aerial view into the Viento Campground and interchange area, directly below. The east leg of the loop would follow an existing dirt service road south from the existing trailhead, then fork uphill along a second service road that crosses within a few hundred yards of the West Bluff crest. A spur trail would climb the last stretch to the cliff-top viewpoints. Like the other summits, some sort of fence or railing would be in order here, as the cliffs drop over 200 feet to the trailhead below. The west leg of the loop would be a new trail climbing a ravine directly below the West Bluff, connecting to the new summit spur. The complete West Bluff loop would cover less than a mile, and gain less than 300 feet elevation, yet give hikers a real sense of achievement. The West Bluff loop would also be the closest of the proposed trails to the main Viento Campground, so well situated to serve campers interested in a modest hike. An interesting option for the West Bluff trail would be a barrier-free route. While this would be a much more substantial undertaking, it would be one of the few viewpoint trails in the Columbia Gorge available for visitors with limited mobility. Much of this proposal builds on the repurposing of existing service roads to become wide trails — at least most of the time. The idea is to allow utility workers to access these roads when needed, but functioning as wide trails as their primary purpose. 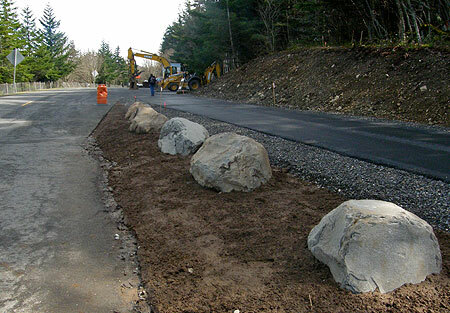 The service roads are owned and maintained by the Bonneville Power Administration (BPA), and see little use by the agency, so a shared purpose might be a way for the BPA to partner with Oregon State Parks to enhance and maintain these routes. There are also several new hiking trail segments in this proposal. All would be straightforward to build, with few topographic or environmental obstacles. 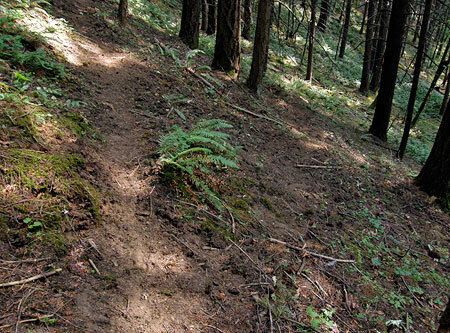 Because they are located in a highly accessible area (access from I-84), these new trails could be excellent candidates for construction by volunteer groups like Trailkeepers of Oregon. One of the advantages of expanding hiking opportunities in the Viento area is the potential to take advantage of the existing recreation infrastructure: two campgrounds, a day use area, a large supply of trailhead parking, restrooms within a few yards of the trailhead, access to the HCRH State Trail and direct freeway access to I-84. Adding new trails to the area would simply make better use of these existing amenities in addition to enhancing the camping experience at Viento State Park. If you like this proposal, there is a unique opportunity to weigh in right now and make your voice heard: share your comments with Oregon Parks & Recreation Division (OPRD), the state agency that operates Viento State Park, and the sole agency responsible for trail planning in the park. 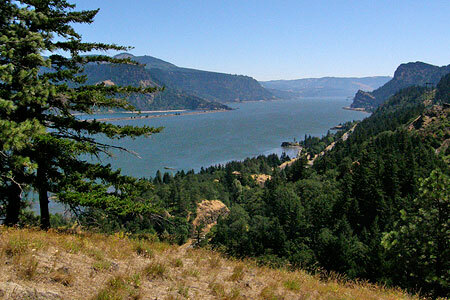 Over the next year the state is conducting a long-range planning effort to scope future recreation needs in the Gorge. [url]You can weigh in with your thoughts over here. [/url] So far, the State Parks have had fairly light participation in their public outreach, so it’s important to make your views known! 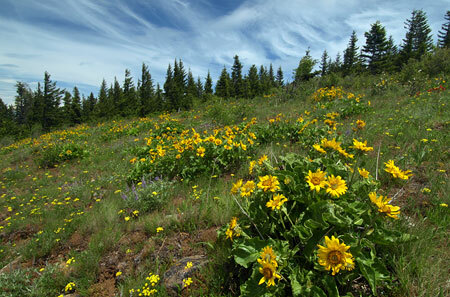 Each spring the parking lot at the Dog Mountain trailhead in the Columbia Gorge starts to look like Black Friday at a shopping mall: hundreds of hikers crowd the trail for the classic hike through steep meadows of blooming arrowleaf balsamroot. Who can blame them? The flower show is spectacular, even with the crowds. 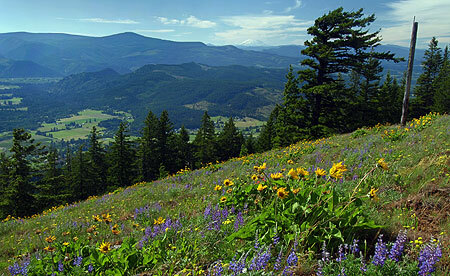 But for those seeking a bit more solitude with their wildflowers — and equally impressive views — the hike up Bald Butte in the nearby Hood River Valley is a fine alternative to Dog Mountain. The blooms usually come a few weeks later here, toward the end of May and into June. Because Bald Butte lies well east of the Cascade crest, the weather is usually better here, too. Measured in travel time from the heart of Portland, Bald Butte is a bit more distant than Dog Mountain. But the somewhat longer drives includes the gorgeous final stretch up the Hood River Valley, which is a treat in itself for hikers. So, why doesn’t the Bald Butte trail see more boot traffic? One answer could be the upper trailhead, which is accessed off Surveyors Ridge Road and is the unintended gateway for 4x4s, dirt bikes and quads to illegally enter the area. While the area trails are only open to hikers, bikes and horses, motorized vehicles continue to be a problem. A second reason for fewer visitors at Bald Butte might be the quality of the “trail” from the upper trailhead to the summit. Here, the route officially follows the Surveyors Ridge Trail (No. 688), though the “trail” is actually an old dirt road that once served as access to a fire lookout on the summit of Bald Butte. 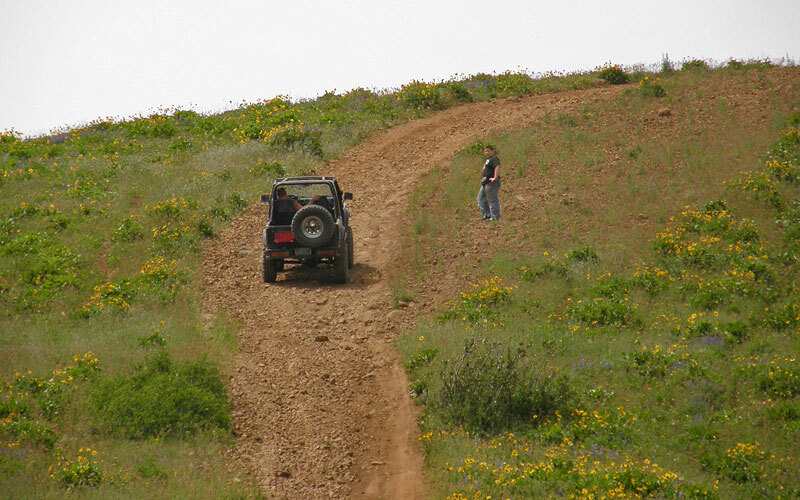 The road is not only difficult to enforce as a “trail”, it also provides a substandard hiking surface in many spots, with the illegal OHV use destroying the surface, and leaving a difficult mess of loose cobbles and ruts for hikers to navigate. Despite these drawbacks, the hike is a spectacular one, and fills a unique niche by providing an early season mountain hike when many trails in the area are still snowed in. More importantly, there are straightforward solutions for resolving these drawbacks, and thus the Bald Butte trail represents a diamond-in-the-rough opportunity, just waiting to shine. This article proposes a few the solutions that could greatly enhance the hiking experience on Bald Butte, while also mitigating some of the environmental problems that currently exist. 1. Formalizes and manages the upper trailhead to prevent OHVs from straying onto trails. 2. Replaces sections of “road” that currently serve as “trail”. 3. Improves the hiking experience where the route crosses the BPA corridor. 4. Establishes a loop trail system that allows for better mixing of bikes and hikers. Above all, the new trail connections in this proposal enhance the scenic experience for hikers by simply bringing them through more of the open meadows that are the main attraction — just as the newer, redesigned trails on Dog Mountain focus on the meadows and river views. 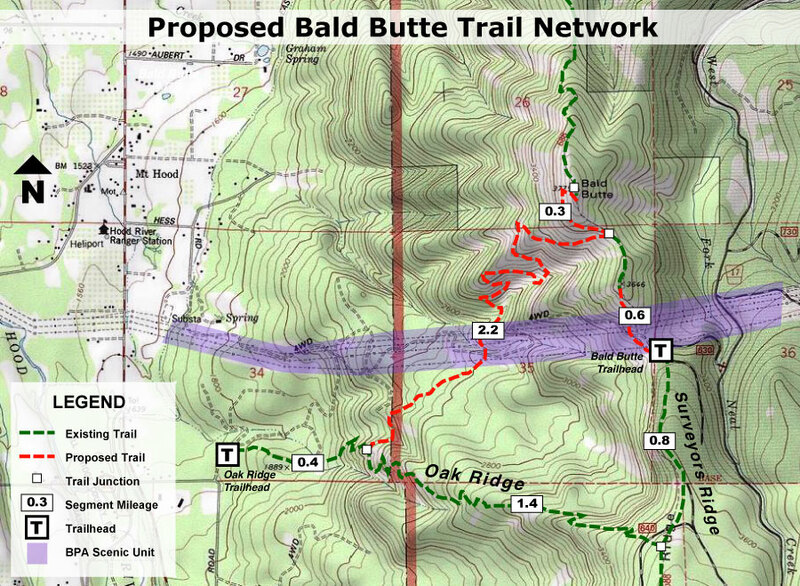 The following maps show these key elements for improving the trails at Bald Butte. The major new addition would be a loop trail starting at the lower end of the Oak Ridge Trail, and climbing the open slopes of Bald Butte. The Surveyors Ridge Trail from the upper trailhead to the summit, where it follows the old road, would be converted to become a true trail. 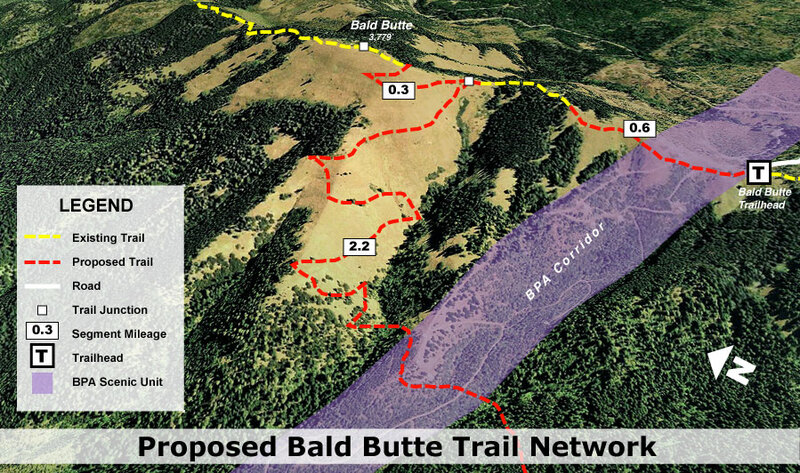 The new sections would be built across the BPA Corridor and along the south summit approach to Bald Butte. The current dirt road segments could then be completely decommissioned, giving the butte a much-needed rest from off-highway vehicles. The BPA corridor, itself, would also be managed differently. 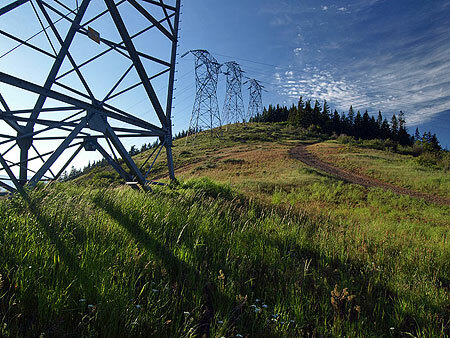 Under this proposal, the Bonneville Power Administration would designate a scenic unit where the transmission corridor passes over the shoulder of Bald Butte. The agency would then manage the vegetation under the transmission lines with an eye toward integrating the corridor with the adjacent forests and meadows, and providing the best possible hiking experience. This element of the proposal could be a pilot project for better management of BPA tranmission corridors in other areas, with new best-management practices developed to address OHVs, dumping, invasive species and other nuisances that tend to follow the BPA corridors. The proposed scenic unit is shown in purple on the proposal maps. 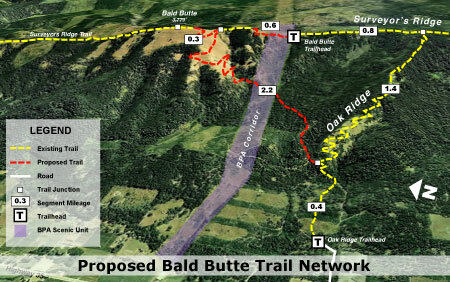 The main draw in the proposal would be a new trail crossing the open slopes of Bald Butte. This is an exceptionally scenic area, and the trail concept could be patterned after the “new” trail on Dog Mountain, with an eye toward creating a world-class hiking experience. 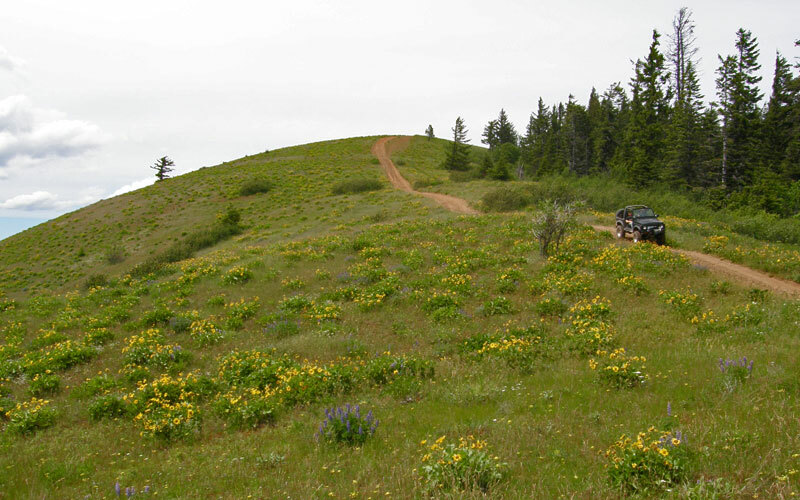 In addition to the spring wildflower spectacle, this expanded trail system on Bald Butte would provide a nearly year-round hiking and biking opportunity. The loop design would also allow for bikes to remain on the Oak Ridge Trail, with the new trail limited to hikers. This would allow hikers looking for a loop trip to use both trails, but reserving the new route for those uneasy with shared hike/bike routes. Finally, the upper trailhead would be retained in this proposal, despite the problems it currently brings with illegal activity. The short access road to the trailhead is unsigned, poorly maintained and the surrounding area is in a raw, semi-developed state that sets the stage for the unlawful activities that occur here. To help remedy the situation, the trailhead could be formalized and improved to appeal to legitimate forest visitors — families looking for a shorter hike or bike to the summit of Bald Butte or along the Surveyor’s Ridge Trail, for example. 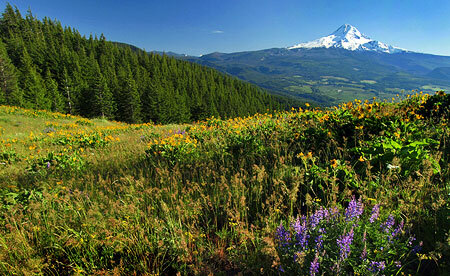 Despite the presence of the BPA towers, the view toward Mount Hood from the upper trailhead is sweeping, and could even serve as a picnic site or more formal viewpoint for motorists touring the area. There is no need to wait until the trails at Bald Butte have been improved, as the current routes provide for terrific hike, especially in spring and early summer. The Oak Ridge Trail serves as the first leg of the hike, beginning from the trailhead of the same name, just off Highway 35. The route then follows the Surveyors Ridge Trail past the BPA corridor and to the summit, following the old lookout road for the final segment.